This column was written by Fred Barnes. There was a moment in Tuesday night's Republican presidential debate that must have caused a massive sigh of disappointment among the media. It came when former Massachusetts governor Mitt Romney declined to attack Arizona senator John McCain on immigration. The day before, McCain had criticized Romney for failing to do something-or-other on that issue. Romney grinned, declared McCain his friend, and said, "I'm not going to make this a matter of personal politics." Why the heck not? That was my reaction. It's personal squabbling among the candidates that the press was looking for. It's what Wolf Blitzer, who ably moderated the debate on CNN, was looking for. And so was I. Serious bickering, preferably by the top-tier candidates, is what makes these events interesting, fun, and worth watching. Any political debate described as polite, as Tuesday's was, is something less than exciting. 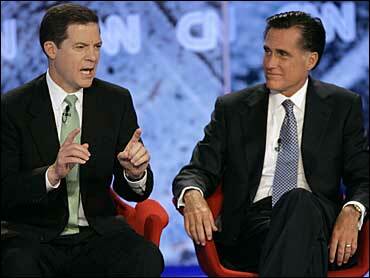 Only on rare occasions do televised debates offer moments of real insight or authentic drama. Everyone remembers (or has heard of) the Ronald Reagan-George Bush clash in a 1980 debate in Nashua, New Hampshire, over control of the microphone. There was also a wonderful moment in an Illinois debate later in 1980 between Reagan and John Anderson, who had been talking with Democratic senator Teddy Kennedy about forming a bipartisan ticket. "Do you really prefer Teddy Kennedy to me?" Reagan asked with a grin. Anderson sputtered, and you realized instantly he wasn't in Reagan's league. The CNN debate confirmed what we already knew about the 10 Republican candidates. If it was an especially good night for anyone, that was probably McCain. He was forceful without being overbearing. "I'm going to give you a little straight talk," he responded to a young woman whose brother was killed in Iraq. She asked whether the war was worthwhile and what needed to be done before American troops could be brought home. McCain got out of his chair, approached the audience, and looked the woman in the eye. He said her family's sacrifice was not in vain and that there would be terrible consequences if the United States loses in Iraq and the country becomes a terrorist haven. So the U.S. must win. It was the strongest answer of the debate. McCain was also effective in defending the immigration reform bill now before the Senate that so many conservatives love to hate. Blitzer mistakenly said President Bush had "proposed" the measure. In truth, it was written by bipartisan group of a dozen senators. I wouldn't go so far as to call McCain the winner of the debate, only that he stood out at times. Former New York mayor Rudy Giuliani also performed well, notably when he contrasted himself and other Republicans to the eight Democratic presidential candidates who'd debated in the same auditorium at St. Anselm's College in Manchester, New Hampshire, two nights earlier. Romney was fine, too. It was clear he's figured out and was trying to emulate one of Reagan's traits: unbridled optimism. And he was pretty good at it. Most of Romney's answers included a reference to his personal optimism or his "vision" for the 21st century or the notion that Republicans are "the party of the future" or the thrilling prospect of selling American goods in Asia. His campaign was once again the fastest with the e-mail. You have to go to your e-mail quickly after a Republican debate to beat the arrival of a Romney e-mail declaring him the winner or something close to that. Last night's e-mail, which arrived at 9:17 p.m., said Romney "stands out by debating substance." This verdict was attributed to one of his press aides. As for the rest, former Arkansas governor Mike Huckabee was quick-witted. He said he seemed to be getting the questions about moral issues but that was better than getting the immoral questions. An ordained Baptist preacher, he gave an eloquent defense of the Christian belief that God created the universe and another one the sanctity of life from conception to death. My guess is that Huckabee's skill and humor in debates, interviews, and stump speeches will give him a future in national politics. But it's unlikely to be one that involves living in the White House. As for the rest of the candidates, Republican congressman Duncan Hunter showed once again that he's a decent guy and a serious conservative. Ex-Virginia governor Jim Gilmore reiterated that he's a conservative of unswerving principle. Republican congressman Ron Paul reprised his role as a libertarian scold. Former Wisconsin governor Tommy Thompson introduced himself as the real Thompson, not the actor. The reference was to Fred Thompson, the "Law & Order" star, former senator, and soon-to-be presidential candidate. Republican senator Sam Brownback emphasized abortion and his faith and did so quite well. But where were the digs, the quips, the cheap shots at rivals? Where was personal animosity? It wasn't there, except for one subtle jab of Tancredo by McCain. One of the CNN questioners noted that Republican senator Judd Gregg had tarred Tancredo as a member of the "know-nothing wing of the Republican party." That wing, history buffs know, was fervently anti-immigrant in the pre-Civil War years. A bit later in the debate and out of the blue, McCain said, "I agree with Judd Gregg." That was as good as it got.